This substantial unit uses galvanised steel reinforcing brackets to enhance its strength and rigidity. K9 galvanised ground fixing brackets are available to enable this freestanding item to be concreted in. The top face and edges of each seat and table board are planed, the remaining parts being rough sawn. When specified in iroko, all the surfaces are planed and sanded. 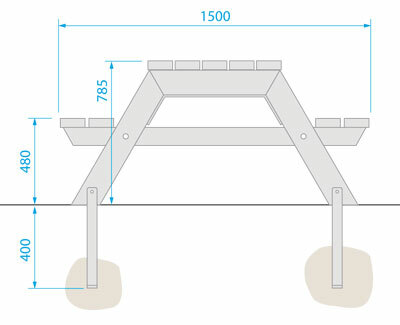 A disabled access (DA) version is available with the table boards extended on one end by 200mm to facilitate access by wheelchair users, for a small additional cost. European oak or treated softwood finished in a dark oak coloured spirit based woodstain.